Through a collaborative effort with NOAA/NCEP and NWS Honolulu, the University of Hawaii has implemented a global-scale WaveWatch III (WW3) model, which in turn provides boundary conditions for this Samoa regional WW3: a 7-day model with a 5-day hourly forecast at approximately 5-km or 0.05-deg resolution. 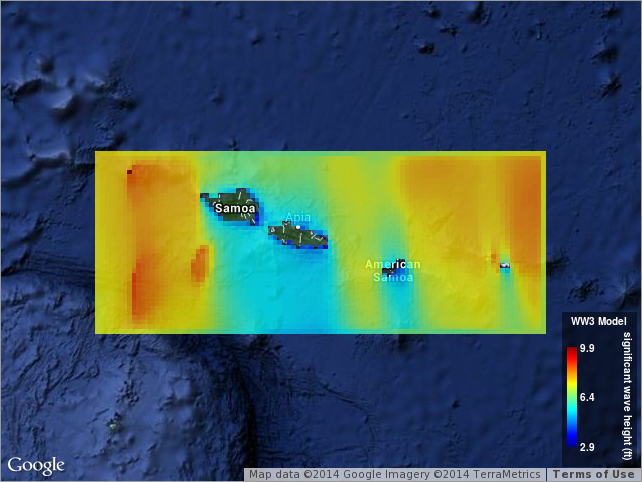 The primary purpose of this regional model is to capture island effects such as island shadowing, refraction, and accurate modeling of local wind waves. The Samoa regional WW3 also provides boundary conditions for nearshore island-scale models via Simulating WAves Nearshore (SWAN). While considerable effort has been made to implement all model components in a thorough, correct, and accurate manner, numerous sources of error are possible. As such, please use these data with the caution appropriate for any ocean related activity.